Who May Be Included in the Bair Hugger Lawsuits? The Bair Hugger lawsuits primarily involve patients who underwent hip or knee replacement surgery, known as a total knee arthroplasty (TKA) or total hip arthroplasty (THA), or who underwent a revision of a prior hip or knee replacement, who were warmed during their surgery by the Bair Hugger forced air warming device, and who suffered a post-surgical infection. The attorneys at Riley & Jackson are limiting the Bair Hugger lawsuit cases we will file to those who meet this criteria and whose infections were confirmed to be deep joint, deep bone, or periprosthetic infections caused by a bacteria that may exist in the operating room. Usually, the only way to know the precise type of infection the patient had is by reviewing the medical records. What are Forced Air Warming Devices? Forced air warming devices are used in the majority of TKAs and THAs and are intended to keep the patient warm during the surgery. They consist of a disposable blanket that connects to a flexible hose attached to a portable heater. The heater has a blower that blows warm air to circulate over the patient. What is the Problem With the Bair Hugger? 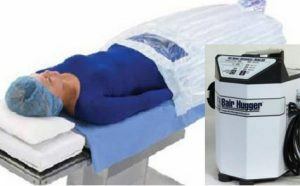 Patients are alleging that the manufacturer and distributor of the Bair Hugger have known for years that the exhaust of the Bair Hugger warmer/blower causes bacteria from the floor of the operating room to rise and enter the sterile field, which causes bacteria to attach to the surgeon’s hands, which causes the physician to place bacteria into the surgical wound inadvertently. Patients are also alleging that the manufacturer redesigned the Bair Hugger in a way that reduced the efficiency of its air filtration system, which caused contaminants to become trapped in the internal airflow pathway and then get pushed through the exhaust into patients’ open surgical sites. These lawsuits also allege that the manufacturer and distributor of the Bair Hugger deceived the FDA about the air flow system in 2009 submissions to the FDA. Has the FDA Recalled the Bair Hugger? There has been no FDA recall of forced air warming devices. The FDA is receiving an increasing number of adverse event reports, however, and the growing litigation will likely lead the FDA to conduct its own assessment of the safety of forced air warming devices. Do I Have a Bair Hugger Lawsuit? The only way to know if you meet our criteria for filing a Bair Hugger lawsuit is to contact a medical device attorney at Riley & Jackson. We can discuss your post-surgical complications with you and make a determination as to whether a review of your medical records is warranted.